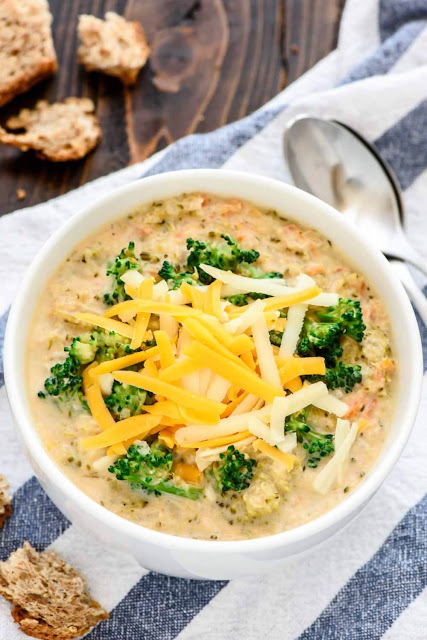 Cooker Broccoli Cheese Soup – Calling all Panera broccoli cheese soup lovers! I’m popping in with a healthy recipe for an easy Slow Cooker Broccoli Cheese Soup that takes less than 10 minutes to prep. This slow cooker soup will make you feel just as warm and toasty as the Panera original. The most easy and healthy recipe for Broccoli and Cheese Soup you’ll find! Made with lots of fresh veggies, cheddar, and your crock pot does all the work. Place the broccoli, carrots, onion, and garlic in the bottom of 5-to-6-quart slow cooker. Top with the cream cheese, oregano, nutmeg, and chicken broth. Stir to evenly distribute the ingredients. Cover and cook on high for 2 hours or low for 4-6 hours, until the broccoli is tender. Recover the soup and let cook on low for 10 minutes until warmed through. Stir the salt, pepper, and grated cheese. Taste and add additional salt and pepper as desired. Recover and cook on high until the cheese is fully melted and the soup is hot, about 5 additional minutes. Serve warm. 0 Response to "Slow Cooker Broccoli Cheese Soup "